Despite a late comeback by the Niagara IceDogs, the Ottawa 67’s rode a good start to take a 6-5 win over one of the OHL’s top teams. They had to hold off a powerful Niagara offence late in the game, but 67’s goaltender Olivier Tremblay stood tall. He made 31 saves for the win. The 67’s wasted no time flying out of the gate, earning the first two goals of the contest. Mitch Hoelscher put up his fourth goal of the season after digging the puck out of a scrum on the boards, walking to the slot and burying the quick shot. 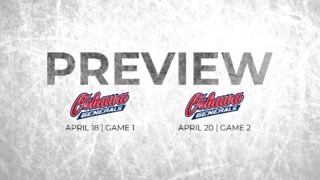 Niagara would even the score at 1-1, and another IceDog would score again – but on the wrong net. Niagara defender Ben Jones picked the puck out of a mad scramble in front with the intention of backhanding it behind the goal, but put it into his yawning net instead, and the 67’s led 2-1 at 16:52. Nikita Okhotyuk was the last 67 to touch the puck, so he got credit for the goal. Ottawa would answer the bell again early in the second frame, when Sasha Chmelevski took a pass from Oliver True and put his team up by two. Billy Constaninou answered for Niagara, but a 67’s veteran had quite the shift in response. Tye Felhaber scored two goals in under a minute – at 14:32 and 15:24 – and it was a wide 5-2 lead for the home side headed into the final intermission. In the third, Shaw Boomhower wasted no time extending Ottawa’s lead and it proved to be the game-winner. At 1:26, he took a long feed from Jacob Cascagnette, deked to the backhand and stuffed the puck into the goal after IceDogs netminder Stephen Dhillon fell back into the net. The score was now 6-2 Ottawa. 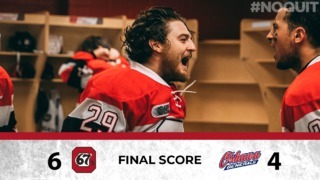 That goal gave the 67’s the two points they needed – they weathered a huge storm in the latter half of the third that saw the visitors score three goals and come back to lead the shot count. 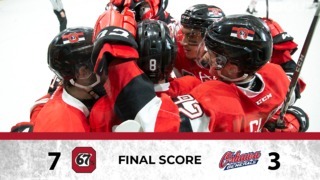 With the victory, the 67’s have points in five straight games. 67’s F Mitch Hoelscher had his first-career multi-point game as a member of the Barber Poles – he notched a goal and two assists. The goal from 67’s F Shaw Boomhower was his first as a 67. 67’s F Oliver True’s two assists were a season-high for the Danish winger. 67’S F Tye Felhaber set a career high for points in a season with his 39th and 40th points of the year. He has 12 points in his last eight games. 67’s F Sasha Chmeleveski, who registered a goal and an assist on the night, has 15 points in his last 9 games with points in seven of those nine games. 67’s single-game tickets start at $12 and are available at Ottawa67s.com/Single-Game-Tickets, by calling 613.232.6767 or in person at The Box Office at TD Place. All minor hockey players part of the 67’s Prospect Program get in for FREE. For more information on the 67’s Prospect Program click here.